Lesley Gillespie, BSc (Hons), Dip Ed, is an inspiring woman, not to mention humble and generous. She says one of the highlights of her life was graduating from Monash University in the 1970’s with her parents by her side chatting with her professors. Upon graduating Lesley taught at Loreto Mandeville Hall Toorak for around 10 years, juggling teaching, two new babies and her role on the board of Bakers Delight. Hard work and no fear of failure have led Lesley and Roger onto a highly successful international business through Bakers Delight which they founded in 1980. “If I have to get stuff done, I just go and do it. It’s all part of that Aussie ethos of ‘have a go’.” she says. This ethic and strength of character has helped build Australia’s largest bakery franchise with annual network turnover of over $564 million in FY11/12. 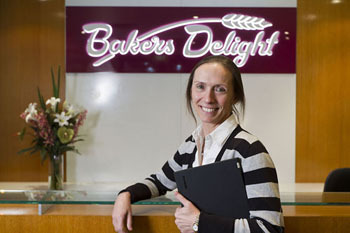 Bakers Delight is now a large franchise organisation with a strong community base. Since 1999 Bakers Delight has raised more than $6.5 million for Breast Cancer Network Australia (BCNA), directly supporting thousands of Australian women and their families through their breast cancer journey. Through its network of bakeries it donates over $143 million in bread to charities each year to local communities. The company supports a range of health and community-based organisations and this is something Lesley feels strongly about. A quiet achiever, Lesley has been the recipient of many prestigious awards, including an OAM award for her service to the community through support for charitable and sporting organisations and to business and commerce.